Password is an important security mechanism to prevent unauthorized access by hackers, but it also gives severe headache and trouble when one forgets its password, especial administrator password to log on to Windows computer. Without a valid password, the Windows system can be considered inaccessible, required to be reformatted or reinstalled, and unavoidable lead to data lost. Note: If you’re on Windows XP, try to access the system with built-in no-password administrator account. 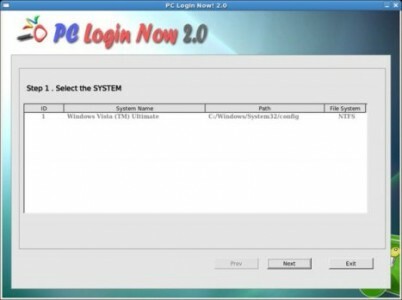 PC Login Now (or PCLoginNow) is actually bootable live CD with tool to reset local administrator and other user accounts passwords or change security settings on Windows system, instantly to gain access to computer again immediately. Thus, PC Login Now can be used as a safe and easy solution to remove existing Windows password that has been forgotten, lost or simply do no have, and assign a new password to the Windows admins or users. The most powerful feature PCLoginNow have is to support bypass SYSKEY mechanism, a utility which is an optional feature added in Windows NT 4.0 SP1, that encrypts the hashed password information in a SAM database using a 128-bit encryption key to protect against offline password cracking attacks so that the SAM database would still be secure even if someone had a copy of it. 100% recovery rate: PCLoginNow resets any passwords on ANY Windows with 100% successful rate. Support SYSKEY: PCLoginNow can easily bypass Syskey mechanism and reset the Windows passwords. Offline running PCLoginNow runs on Linux Live CD. Securest technique: PCLoginNow uses the securest way to reset passwords and other settings. You don’t have to worry about system corruption after using PCLoginNow. PCLoginNow supports all Windows filesystems including NTFS, FAT16, FAT32. PCLoginNow is able to handle all popular Windows operating systems including Windows Vista (SP1), Windows XP (SP1, SP2, SP3), Windows Server 2003, Windows Server 2008, Windows 2000/NT. PC Login Now runs on Linux CD which indicates most of the new Hardwares are supported by PCLoginNow. Computers with IDE, SATA, SCSI, USB or Firewire(IEEE 1394) Hard Disks as well as a wide range of PCI PCI-EX card are completely supported. Easy to Use PCLoginNow is designed for non-professionals, which means everyone can access their computer in no more than 5 minutes. 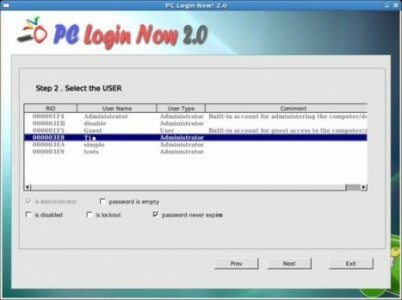 To use PC Login Now, download the PCLoginNow_Full_2.0.ISO Live CD file from SourceForge.net, and then burn the ISO file to CD using your favorite CD/DVD burning software such as Nero, Ashampoo Burning Studio (free license for Ahsampoo Burning Studio 6 and Ashampoo Burning Studio 2008) and Roxio. Other freeware software programs able to burn ISO file to disc include ISO Recorder, BurnCDCC, ImgBurn (for Windows) and K3b (for Linux). After burning and creating PCLoginNow bootable live CD, insert the CD into optical drive disc tray, and boot up computer from the CD to start and run PCLoginNow autmatically. Normally, user is required to press any key on BIOS boot screen to boot from CD. If you don’t see this message, or cannot boot from CD, change the boot device priority or sequence list in BIOS to make CD/DVD drive comes on top. On PC Login Now wizard, select the system with the user account to recover and reset the password. Each system detected is listed with its ID, System Name, path to SAM files and filesystem to help user recognize the correct system. Then, user able to select the administrator accounts or user accounts, complete with UID, User Name, User Type and comment, to apply any of the five characteristics listed below. is Administrator: if the account has the administrator privilege and rights. password is empty: if the password of the account is empty or blank. is disable: if the account has been disable due to the operation of administrator or the system rules. is lockout: if the account has been locked due security breach such as too many unsuccessful login attempt. password never expire: if the account has to set password on a specific expiry date or the password will expire after a set period. Note that if the Windows account has already contained no password and is of administrator type, the two special properties are grayed out and disabled. User cannot downgrade administrator account to normal user account or create a password to an account in PCLoginNow. Existing states for the account are automatically checked. Change any of the properties to the selected user account by ticking or unticking the check boxes, then click on Next button to apply the new settings. To reset the password, select the check boxes for password is empty and password never expire to make the account no longer has password, and can log on by leaving password field blank. PC Login Now is a freeware and supports all Windows operating system including Windows Server 2008, 2003, Vista, XP. PCLoginNow can support dual boot systems too. Download size is just 55 MB.